Since the summer of 2018, Alivia Faris has worked alongside Lay Leaders to deliver Faithful Families to church members of Louisa United Methodist Church in Louisa, Kentucky. Faris is the County Agent for the Family and Consumer Sciences Education program at University of Kentucky Extension. Over the past few years, she has developed a long-term relationship with the church and its members. Faithful Families has been great for families in this community, especially for building relationships with youth and promoting healthier habits. On average, 18 church members participate in each session of Faris’ Faithful Families classes. 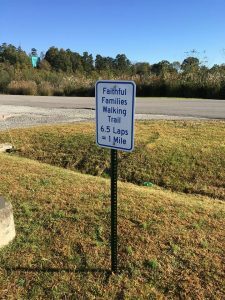 Louisa United Methodist Church has installed a walking trail (which was secured through a UK FCS Mini Grant), and they have developed plans for vegetable gardens in the same location. The program has helped the church members better understand what it means to make healthier choices. Some members have also discovered nutritious options that they have never tried before attending these classes. Long-term engagement programs like Faithful Families do not come without their particular challenges. Faris shared that it was a challenge to adapt classes to accommodate numerous children at church meetings. It also took time and effort to get the program rolling initially. However, since the program kicked off, it has been smooth sailing. And it doesn’t stop there! Faris will continue to hold monthly Faithful Families classes at Louisa United Methodist Church. She will also be working with the church leaders to improve the health of not only the faith community but the members of the Louisa community at large. Edit: The blog post originally stated that Alivia Faris began working with the faith community in 2017.